Approach: This area is found between the towns of Lake Louise and Field. 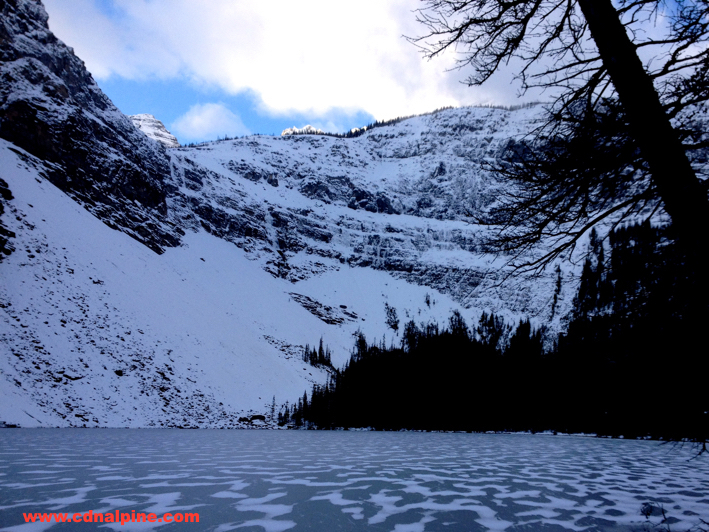 Drive West from Lake Louise on the Trans-Canada Highway (#1) for 12.5km to the signed parking lot for Lake O’Hara. The climbs are visible in the distance below a hanging valley on your left a few minutes before reaching the Lake O’Hara parking area. As soon as you cross the tracks, park on the left at the start of a gated road. Walk along the road for about half an hour until reaching the signed trail to Ross Lake on your right. Follow the trail to Ross Lake and the climbs are visible up the avalanche slopes on the other side of the lake. Choose your own adventure to get up to the climbs, either follow a trail around the right side of the lake then bushwack towards them, or go more directly across the lake. Total time of 2-3 hours depending on snow conditions. Best very early in the season before much snow accumulates. 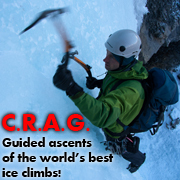 Route Description: A variety of lines form most years, sometimes all ice, sometimes mixed. Seldom visited and little is known about what lines have been climbed and in what conditions. The right hand line went at about WI4, M3, 100m in Oct 2016 and is good quality. Gear: Screws including stubbies. Mixed rack including pitons may be required depending on chosen route and conditions. Objective Hazards: Serious avalanche terrain on the final part of the approach, and from above on either side.